Maryland commit and St. John's (Shrewsbury) star Sean Burke is now alone as the Pioneers ace. St. John’s Shrewsbury’s 2017 season ended the way many thought it would. 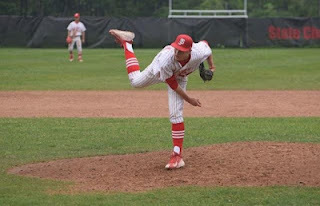 Leading St. John’s Prep 5-4 in the top of the ninth inning of the Division 1A “Super Eight” finals, Pioneers’ ace Ian Seymour spun an 0-2 changeup past Tyler MacGregor to begin the celebration. Catcher Jack Gardner embraced Seymour and the rest of the St. John’s squad that overwhelmed the opposition for most of the season followed. A loaded senior class that included Gardner, Seymour, number two-starter Matt Stansky, and shortstop David Turco capped off their career in picture perfect fashion. Sean Burke, who came charging in from first base, however, is back for his senior season ready to lead St. John’s back to another dog pile. A two-sport athlete, Burke has become a fan favorite in the St. John’s community for his play in the winter and spring. During the snowy months Burke sends the Pioneers’ fan section into a frenzy with his play on the hardwood. Over his four-year basketball career Burke repeatedly threw down highlight reel dunks and put up dazzling 20-point performances. While his play on the basketball court for legendary coach Bob Foley received thunderous applause, it is on the mound in the spring where Burke’s dreams are closer to becoming a reality. Burke began to realize his baseball talents when he was 13 years old. As an eighth grader at Sutton Middle School, Burke played on the Junior Varsity team and used his athletic build to keep up with the players who in some cases were three years older than him. After a successful spring Burke looked to St. John’s as a way to see if he could compete with the best in the state. Burke played on the Pioneers’ Junior Varsity team as a freshman before embarking for his summer season. That’s when Burke’s baseball aspirations – which had been on the runway – took off. Following a performance over the summer, coaches approached Burke from Boston College and Bryant. A process began that took Burke for a wild ride. Burke's interest rapidly increased in the summer after his spring season on the Pioneers' varsity team. On the mound he became more appealing for collegiate suitors as both his size and velocity spiked. Burke jumped to six-foot-4 and his wingspan became a daunting force for opposing hitters once he took the mound. The University of Maryland offered and in the October prior to his junior year Burke accepted. “I really liked Maryland because the school is beautiful, the social life is awesome, and of course the baseball program,” said Burke. Burke’s future seemed like a sure thing but one month prior to the Pioneers’ Super Eight run, his recruiting process – that seemed all finished up – took a bizarre turn. Virginia Tech announced the dismissal of baseball coach Pat Mason. To fill the void, the Hokies hired the person who helped entice Burke to become a Terripan in John Sfezc. That thought was short lived with Maryland promoting hitting coach Rob Vaughn and hiring pitching coach Corey Muscara who Burke had become acquainted with through his first trip on the recruiting trail. “Once Coach Vaughn stayed there – he was the hitting coach before – and Coach Muscarah from st. john’s came over I knew I wanted to stay at Maryland," said Burke. "Despite the change over I was still comfortability due to the fact I knew most of the incoming coaches." Now, with his recruiting process behind him Burke’s sole focus is being at the center of a Pioneers team in search of a second straight title. His six-foot-5 length, and even greater wingspan, gives him the ability to pitch downhill consistently. Burke can get it up to 91 miles per hour on the radar gun while deceiving hitters with equally effortless delivery with his changeup. When up in the count Burke will often turn to his quickly disappearing slider to retire the opponent. Last year Burke was mostly used for his offensive capabilities. While manning first base for Charlie Eppinger’s club, Burke hit over .400 with a pair of home runs. As the calendar turns to this year, Burke’s main responsibilities will take place on the mound. He is expected to take on the role as the Pioneers’ ace, in charge of navigating some of the top lineups in the Bay State. It’s an opportunity Burke has been waiting over four years for. In a St. John's uniform being the ace will certainly come as something new for Burke, but if the performances of past top of the line Pioneers' pitchers such as Seymour and Jared Wetherbee is any indication, Burke is in line for a dominant senior season.